2018 Land Pride PS1572 for sale in Norfolk, NE. Dinkel Implement Co.
Cat. 1 Hitch: Fits Land Pride Quick-Hitch for easy one person hook-up to tractor. 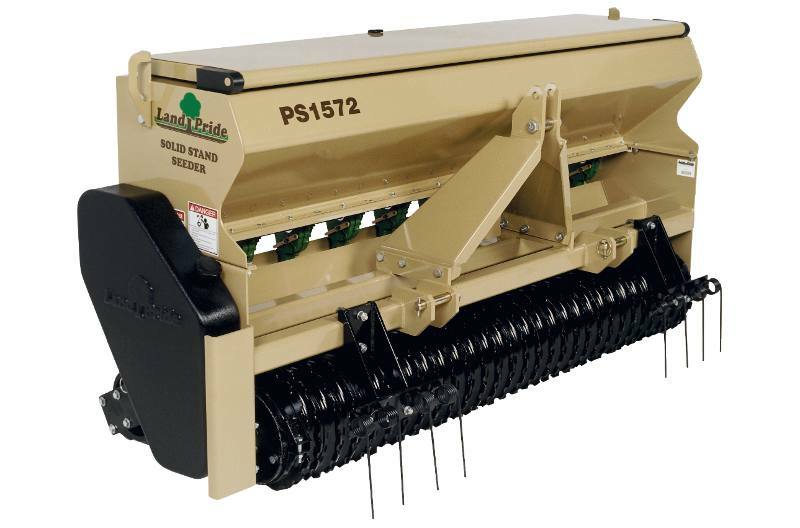 70 1/2" Seeding width: Perfect size for landscape market. Sized for smaller areas such as between the curb and sidewalk or the new community park. Approximate machine weight: 1,165 lbs. Heavy weight helps seed to soil contact. Lift hooks: Lift hooks on each side of the seedbox to attach chain or strap to for easy loading and unloading. Heavy-duty lids with stay open support: Lids are precision fit to keep seeds dry and rodents out and they won’t buckle or slam shut in high winds. Seed splash guard: Seedbox lid has a guard to prevent seed from being spilled between lid and box. Water tight Seedbox: All-welded seedbox construction. Keeps moisture out of the seedbox. Easy seed box clean out: Seed flute is designed for easy clean out. Simply move the flute lever into the clean out position and all seeds will be removed. Large seedbox capacity: One bushel per foot. Keeps filling to a minimum and increases productivity. Grass seed cups: Grass seed model uses 10 proven fluted seed cups for accurate seed rates. Seed box agitator: Eliminates bridging of seed. Powdered metal in fluted sprockets: Helps dissipate heat from the fluted area and plastic seed cup housing. Wind guarded seed drop: Protects the seed from being blown away by windy conditions. Ensures constant placement of seed across the whole width of the machine. Seed rate adjustment: Easy adjustment of seed rates. Lever position is located on seed rate chart. Seed rate decal: Positioned on lid. Easy access to seed rate information. High/Low seed settings: Easy adjustment on sprocket arrangement on seed cup drive. This allows for a very broad range of seed settings. Ground driven metering: Front packer rollers are in constant contact with the ground to ensure consistent metering of seed. Seed metering stops automatically when front packer is raised off the ground. Cast iron front packer rollers: 12” diameter front rings and 9 1/2” diameter rear rings are used to crush the clods and pack the seed in to promote seed to soil contact. Spring mounted rear packer rollers: Rear packer rollers are spring loaded for additional down pressure, and to stay in contact with the ground. Tire track removers: Coil spring tine track removers keep their shape; one on 48” model, two on 72” model allows tractor tire(s) to be scratched out. Additional track removers can be added. #40 Roller chain: All drives utilize #40 roller chain for smooth running. Spring loaded chain idler: Spring loaded idler keeps constant pressure on chain so seeding rate is consistent. Seeding Width (Broadcast): 70 1/2 in. Overall Width: 79 1/8 in. Overall Height: 38 7/8 in. Overall Length: 29 3/4 in.